Urban Archeologist: He Digs! He finds..Tackle!...He scores! Look in every drawer, every corner, at every sale...unless it's "off limits." I will often pick up items I don't collect, although I now believe I'll collect anything, just because of the age or how it looks. 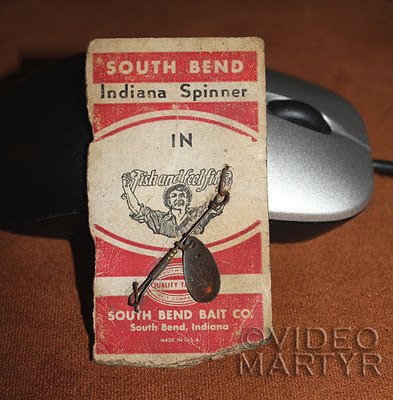 This little spinner was never used and sat around thinking it would never catch a fish. Well, it caught me. Any idea on how old this is, or why it never got used? Maybe they developed a more efficient way to catch sardines...instead of one at a time. Used to use these as a kiddie in the Rahway river behind our Folks house. Was a small river with sunnies, minnoes, carp; the metal spoon thing would spin around and reflect light and attract the fisheys as you reeled the line in. There would be a hook attached below the spinner O'course. Good memories!! OH, we bought the spinner from Amorellies Sport Shop in Rahway...long gone sorry to say.